Welcome to the "house of pve" - as beautifully rendered by Michelle, of Schematic Life. She captured my home so wonderfully. She has a way with markers and interiors as well as exteriors - drawing what she sees. Take time to see her stunning work. Really beautiful. I want to be invited in for early morning coffee. Show us where she will be hanging. So pretty - she does do amazing work! Now that would be lovely, to have a morning coffee face to face rather than blog to blog! thanks for taking time to visit and to comment. Gorgeous is right, with a capitol G! Oh... Patricia your home drawing is beautiful!! AND she does this all with markers?! WOW... simply Beautiful!! beautiful picture, your home is wonderful. I love it! She really captured your home. Yes, markers and chalk...it's the way I learned to do interior renderings for communication, as an Interior Designer, and it's just stuck with me. I'm just never happy with my watercolours...but I love to add a bit to my sketches when I travel. I really liked the guoche painting you did Patricia! I think I am going to take a mixed media class at Emily Carr next month; should be fun! Your home looks very artsy and the rendering is fabulous, makes me want to go buy some markers. Boy you get alot of presents! 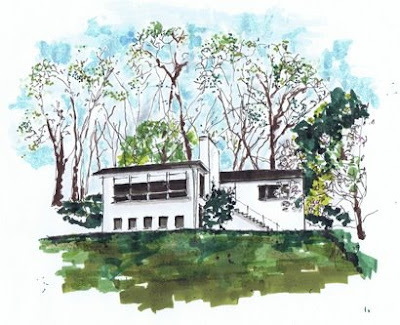 lovely home AND lovely drawing! It looks like such an airy and inviting home. Are those awnings on the windows? I recognize the work of a prismacolor marker! Those things are wonderful! Such a lovely and thoughtful gift. It is so beautiful! Oh so pretty. I love Michelle's work and seeing that I've gotten to see your lovely home in person she drew it perfectly! i'm crazy about renderings! this 1 is beautiful! thanks for sharing! I remember the photo of your home you posted a while back..this is a really beautiful drawing of it! Wish I could come join you for coffee. Beautiful! I keep many artists in my reader (and of course in my etsy favorites if they show their work there). Thanks for alerting me to this one. Oh wow. Your home makes beautiful artwork! What a special piece to have. your home suits you well. it looks artsy, interesting, and welcoming. lovely. What nice work. Your house is very handsome. What a beautiful rendering of your home.